Thanks to a 13 per cent increase in ultra-high tensile-strength steel, a new full inner frame construction method, and a new-to-Subaru foam-filled crossmember, the seventh-generation Liberty is actually said to be up to 70 to 100 per cent stiffer, depending on which metric you look at. The second engine is the first turbo since 2012 under a new Legacy hood. The lower apron has also been tweaked to incorporate a wide, black trim piece that connects both fog lamp enclosures that are subtler in appearance. This tan colour's also applied to elements on the doors and dashboard. The Legacy alsogets more tech in the cabin. Subaru says that the interior is refined, and the new Touring trim gets genuine Nappa leather. The 11.6-inch touchscreen features Apple CarPlay and Android Auto compatibility plus available built-in navigation. The large screen clears up a lot of switchgear found in the previous Legacy, and it forces the air vents to be repositioned to either side of it. Subaru says refinements have also been made to the cabin construction so that it's nearly 3dB quieter at highway speeds, while the dash and door trim designs have been restyled. Any decision to end right-hand-drive production of the long-running model will come as a blow for Subaru fans and typical Aussie families who want a relatively roomy vehicle without stepping up to an SUV - particularly when the new generation takes a significant step forward. The front suspension setup employs MacPherson struts with new internal rebound springs, aluminum lower L-arms and a 23 mm hollow stabilizer bar. The rear suspension is a double-wishbone layout with a 19-mm hollow stabilizer bar. 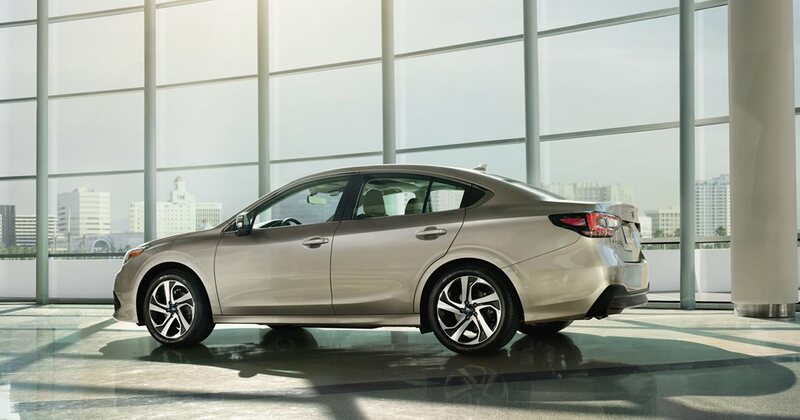 Depending on trim level, the Legacy comes with either 17- or 18-inch alloy wheels, with four-wheel ventilated disc brakes being standard. Overall, though, this new model is recognizable as a Legacy, which could be a good or a bad thing, depending on perspective and sense of style. The turbocharged 2.4-liter four-cylinder ripped from the three-row Ascent, carries over to upper trim levels. Subaru didn't change its traditional powertrain recipe, keeping the Legacy's boxer engines and standard all-wheel drive. The EZ36 six-cylinder boxer and EJ25 turbo four-cylinder engine have been discontinued, leaving the Legacy with the FA24 and FB25. That has 182 horsepower and 176 lb-ft of torque, and will be combined with a CVT transmission. It also allows Subaru to add more driver-assistance safety features in the form of its clever EyeSight stereo camera-based system. Available safety features include a 180-degree front-view camera system, driver fatigue monitoring, steering-responsive LED headlamps, blind-spot monitoring, autonomous braking in reverse, and rear cross traffic alert.